Increasing contamination of environment by emission of toxins has elevated the risks of ocular inflammation, also known as uveitis. Evolving medical technologies and drug discovery developments have paved way for effective treatment of ocular inflammation. A range of options for treatment of ocular inflammation are being offered to patients – mild inflammations are being treated by the use of corticosteroid eye drops, while oral administration of immunosuppressive agents is being preferred to treat posterior uveitis in both eyes. As global pollution levels soar uncontrollably, future generations will be more susceptible to eye inflammations, putting stress on healthcare industry participants in creating affordable and accessible avenues for adopting ocular inflammation treatments. Transparency Market Research foresees that by the end of 2026, over US$ 1 billion worth of revenues will be generated by the sales of drugs and adoption of medical procedures for ocular inflammation treatment. Currently, the incidence of such sight-impairing disorders is witnessing a sharp increase instrumented by multiple causes, from autoimmunity problems and bruising the eyes to infections occurring near the eye. Toxins penetrating the eyes are observed as the foremost factor driving the global incidence rate of uveitis in the coming years. During the period, 2017-2026, the global market for ocular inflammation treatment will be reflecting a high value growth at a CAGR of 6.9%. In 2018 and beyond, majority of uveitis patients will be using corticosteroid eye drops for treating their eye inflammations. Considering how ocular inflammation at the back of eyes can become extremely severe if unattended, corticosteroid eye drops are being viewed as the most affordable, convenient and effective treatment for such ocular inflammations. Anterior uveitis is characterized by its localization – front of the eye, making it the most common form of ocular inflammation in the world. Young and middle-aged demographics are most susceptible to anterior ocular inflammation. Severity of anterior uveitis can also lead to lung infections, gastrointestinal problems and rheumatologic diseases. By 2026-end, more than US$ 530 million worth of ocular inflammation treatments will be used to cure anterior uveitis. For long-term effectiveness, majority of ocular inflammation patients are preferring combination therapy, wherein therapeutic procedures are supported by a prescribed intake of medicines and pharmaceutical drugs. In mid-2017, the FDA’s uveitis pipeline has witnessed the emergence of new drugs & therapies, which include ADX-2 or NS2 by Aldeyra Therapeutics, a dexamethasone implant developed called Ozurdex developed by Allergan, and fluocinolone inserts such as Medidur by pSivida. In the coming years, majority of products and therapies on ocular inflammation treatments will be developed by companies namely, Allergan Plc., Valeant Pharmaceuticals International, Inc., Novartis AG, Abbvie, Inc., Eyegate Pharmaceuticals, Inc., Alimera Sciences, Inc., pSivida Corporation, Cipla Ltd., Pfizer, Inc., and Akorn, Inc. Novel injection techniques will be introduced for treating ocular inflammations with new formulations. Through 2026, several market players will also focus on discovering new local steroidal agents to treat non-infectious ocular inflammations. Eye inflammations or uveitis are becoming a common problem for people across global geographies. New drugs are being discovered to treat ocular inflammations, and companies are investing millions for their approval through regulatory pipelines. Patients are exhibiting a particular preference to the type of ocular inflammation treatment being adopted, considering the range of treatment options, their comparative effectiveness, and convenience in terms of mode of administration. The global market for ocular inflammation treatment is expected to grow sharply in the coming years. Prominent market players are diversifying their product lines to cater treatment of all forms of uveitis occurring worldwide. Transparency Market Research’s latest report offers key insights on how the global ocular inflammation treatment market will expand during the forecast period, 2017-2026. This report sheds qualitative information and forecasted market size evaluations on the global ocular inflammation treatment market expansion for the assessment period. There are a range of advantages of availing this TMR study, particularly for companies interested in expanding their stakes in the global ocular inflammation treatment market. A constant dialogue industry leaders, opinion makers, trade analysts and market participants has generated volumes of data, which has been analyzed across multiple parameters during the development of this study. From pricing and cost structure to supply chain characteristics, the report supplying objective information on how the global ocular inflammation treatment market will evolve in the coming years. This information has been validated through authentic quality checks and data screening processes. 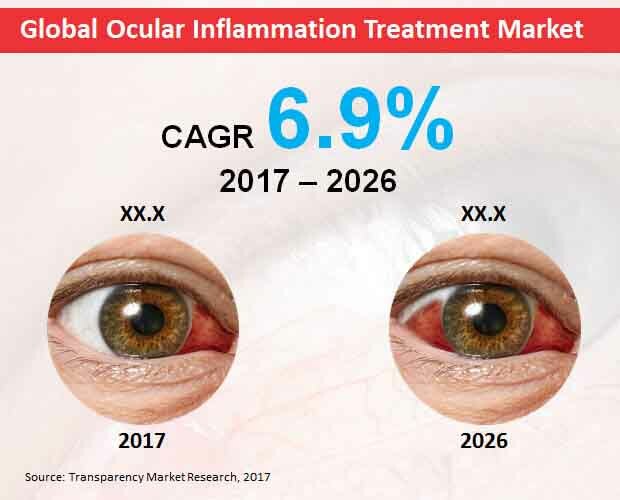 New opportunities for market growth have been revealed, and a slew of first-hand information makes this report a valuable document for companies aiming to expand their business in the ocular inflammation treatment market. The presence of pharmaceutical industry leaders is fairly consolidated in the global market for ocular inflammation treatments. The report has profiled these market players extensively, tracking their growth till data and tracing their strategic developments in the recent past. Unbiased analysis of such information has generated insights on how a particular pharmaceutical company will take steps towards expanding its stake in the local as well as global ocular inflammation treatment markets. The current stance of the FDA towards clearing the uveitis pipelines has also been addressed while measuring the potential of companies in contributing immensely towards the future of global ocular inflammation treatment market. Information on their investments portfolio, R&D undertakings and mergers & acquisitions has been summarized to extend the understanding of companies in terms of competitor analysis. The overall scope of this report is to ensure that key companies in the global ocular inflammation treatment market take informed steps towards future market direction.